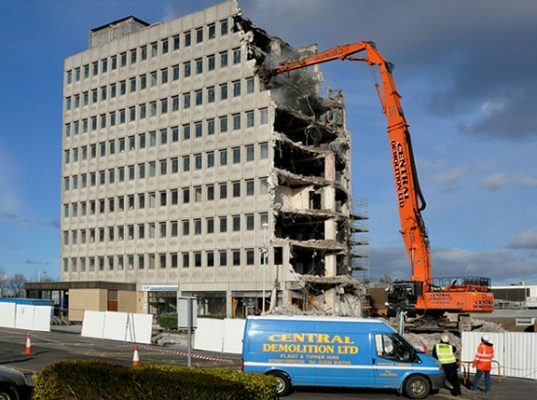 Central Demolition Limited were awarded the contract for the demolition of the former Virgin Media offices, located on Maxwell Road in Glasgow. 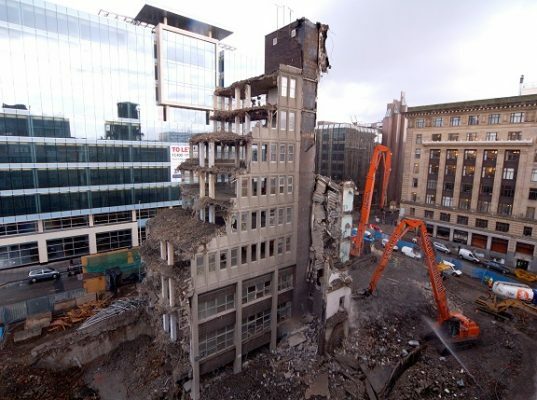 The structure to be demolished was a 6 storey concrete/steel framed office block, approx. 50m x 15m x 18m high. 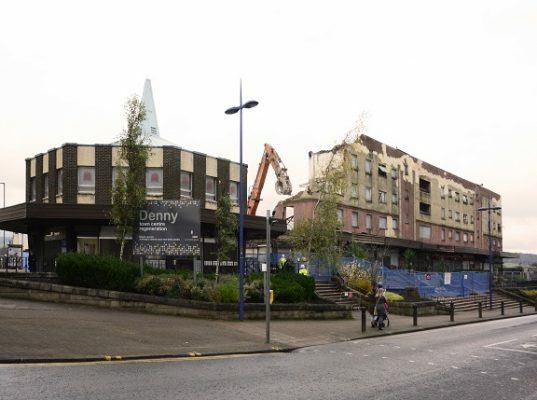 As always, we undertook a lot of pre-preparatory work to ensure that the structure was safe to be demolished. All services were disconnected, and then our team moved in and soft stripped all fixtures and fittings. 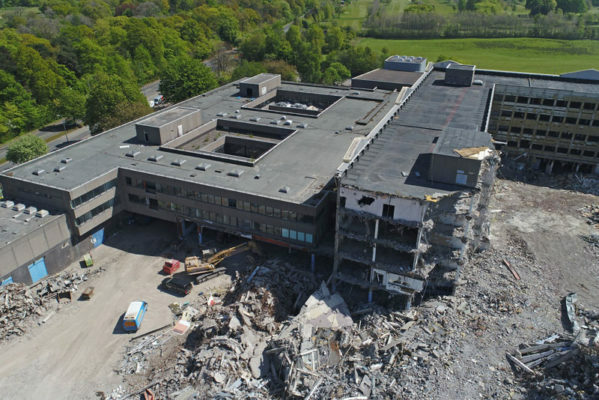 One of our specialist asbestos removal teams was brought onto site to remove all asbestos containing materials which had been identified in the asbestos survey commissioned prior to our commencement on site. Licensed asbestos materials were present in 3 areas of the structure – in door over-panels and backboards to electrical equipment. These removal works were carried out within sealed enclosures under HSE notification procedures. 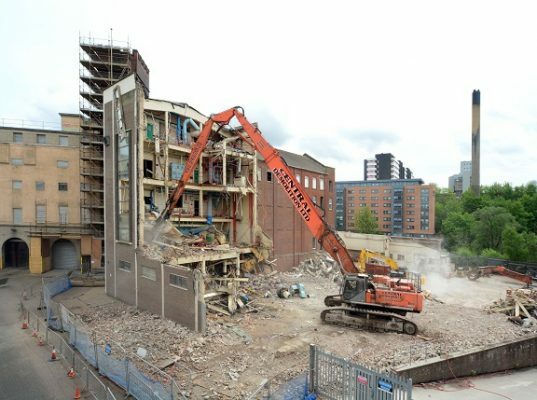 Further to the pre-preparatory works being completed, demolition commenced. 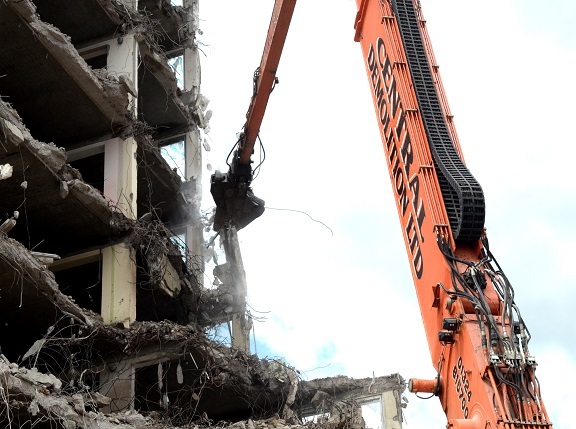 The chosen method of demolition, based on taking all factors into consideration, was demolition by remote high reach machine. A variety of attachments were used throughout the works including pulverisers, hydraulic shears and grapples. This project was not without its complications. There was a major challenge at the beginning, as a live mains gas pipe runs into the rear area of the site. For safety, exclusion areas were set up around same and all operatives working on site were notified of the risks when inducted on site. The site also has single route access, which is just off a busy main road. For safety, and to prevent any disruption, a banksman monitored and managed the access area at all times. In addition, interaction with Network Rail was required throughout the works as the site bordered a live railway line. 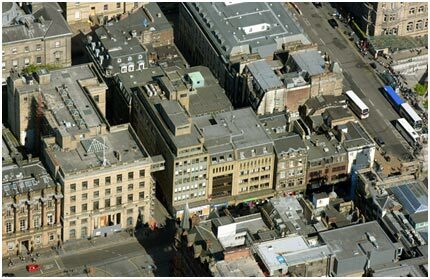 We undertook extensive waste management on this site. 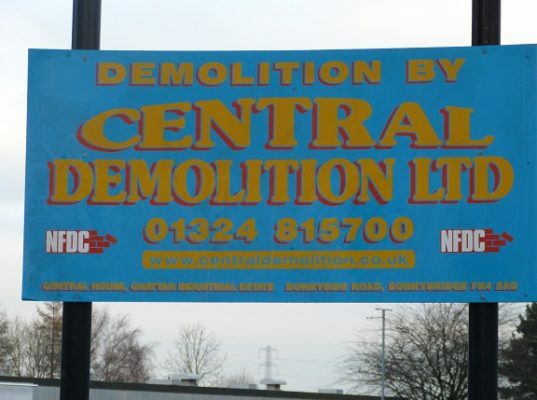 Many materials such as concrete, bricks and blocks are being crushed on site for re-use by our clients. With the project recently completed, it is estimated that we will have achieved a recycling rate of at least 94%. We used this project as an opportunity to trial a partnership with Yooz Reuse and Recycling, a social enterprise which was set up to support the Scottish charity Active4All. Their initiative supports our aim of diverting as much waste from landfill as possible. They visited the site several times and we allowed them to take items such as furniture to be grubbed up and sold to the public from their Reuse Centre near Bellshill in Glasgow. The trial was successful and we are delighted that our partnership with Yooz will now be ongoing. As the project drew to a close, we broke out the foundations and crushed materials on site. 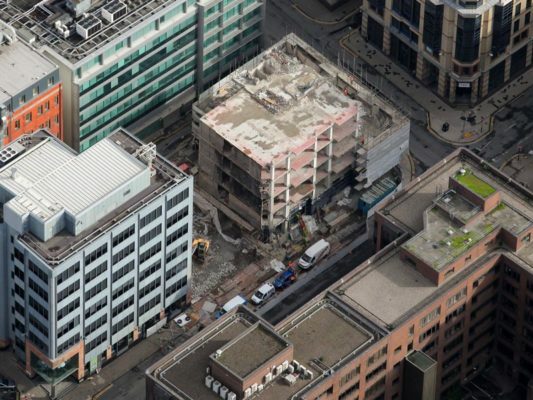 When the works were completed we tidied the site and left it ready for future development. Overall, the above was a very successful project. The works were completed with a 100% safety record, on time and within budget. Our clients were very satisfied with our work, and we are delighted with this as our business is built upon strong relationships and repeat business.